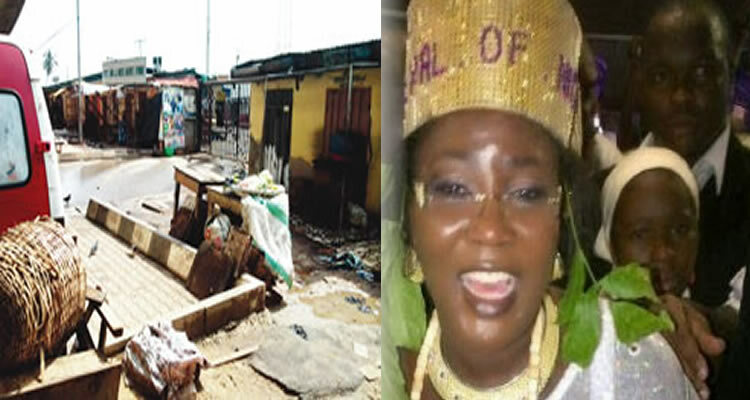 Traders in the Abibatu Mogaji Model Market, popularly known as the Iponri Market in Lagos, have lamented the abrupt closure of trading activities by the state’s market leader, Mrs. Folashade Tinubu-Ojo. Tinubu-Ojo is the daughter of a national leader of the All Progressives Congress and a former Governor of the state, Bola Tinubu. The traders, many of whom refused to identify themselves for fear of being victimised, said no explanation was given for the action. They alleged that Tinubu-Ojo led a team of policemen and some enforcement officers from the government, to lock up the market on Saturday around 3pm. When our correspondent visited the market on Tuesday, he saw some policemen in a Rapid Response Squad truck parked in front of the market. All commercial activities were grounded. Some of the traders sat in groups, lamenting the situation. A fashion designer told PUNCH Metro that there was confusion on the day the market was shut. She said, “I was in my shop on Saturday afternoon when I saw a group of policemen. They could not have been less than 20. They were led by the Iyaloja-General (Tinubu-Ojo). There were, however, conflicting speculations from the traders over what led to the closure of the market. Some of the traders said the development might not be unconnected to a leadership tussle between two people in the market, which led to one of the parties being locked up in the police cell. A soft drinks dealer said, “A member of the market committee was humiliated by another leader in the market a few weeks ago. The man’s cloth was torn to shreds by the other leader, who is a woman. He was also slapped eight times. “The man expected the market committee to intervene and punish the woman, but nothing was done. He said the woman later alleged that members of the committee were responsible for her ordeal and consequently reported them to the Iyaloja, which led to the closure of the market. Another market source, said the closure was due to non-payment of market dues to the national association of the traders, adding that the fight between the two parties only worsened the crisis. He alleged that members of the committee were corrupt and were not remitting the monthly dues paid by traders to the association. A widow with five children, who sells vegetables in the market, lamented that her goods were getting spoilt. When our correspondent contacted Tinubu-Ojo on the telephone, she said the matter should be sent to her as a text message. When she was called again, she said she was busy. However, she had yet to reply to the text message as of the time of going to press. This entry was posted in Politics, Relationships, Teens 14 - 19 years of age. and tagged Mrs. Folashade Tinubu-Ojo, Traders Lament As Tinubu's Daughter Shuts Down Market.